In a ceremony organised on 29 August 2017 at the Ministry of Interior, Trans Adriatic Pipeline AG (TAP AG) delivered 600 personal backpack fire extinguishers and 100 fire-retardant uniforms to the Albanian authorities. This equipment will enable emergency services to cope with wildfire situations across the country, especially in areas along the Trans Adriatic pipeline (TAP) route. 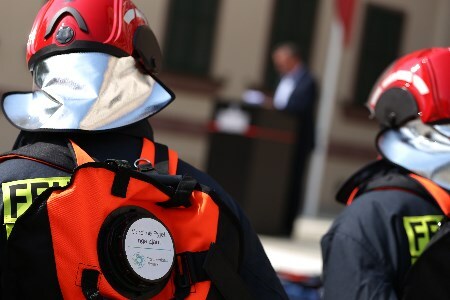 In co-operation with the Ministry of Energy and Industry, the Ministry of Interior and the Civil Emergency Services, TAP AG managed to provide the fire extinguishers and uniforms within a short period of time. This equipment will enable firefighters to be more efficient in their fight against wildfires, as well as reduce the risks of heat exposure. The backpack fire extinguishers and the fire-retardant uniforms will be delivered to emergency services across Albania. The ceremony was attended by representatives of the Ministry of Interior, the Ministry of Energy and Industry, Civil Emergency Services, firefighters, State Police, Armed Forces, Forest Service etc. Taking into consideration the high risk of fires during the summer season, TAP AG, in co-ordination with the Ministry of Energy and Industry, and the Ministry of Interior, will provide, in a second stage, fire engines and ambulances that can access mountainous areas. A long-term investment in Albania, TAP AG is committed to building sustainable and long-term partnerships with local stakeholders. TAP AG has, in the past, provided aid for overcoming several emergency situations in Albania. During the harsh winter of 2016 - 2017, which locked down many villages, TAP AG assisted more than 1300 households by providing food packages and blankets.